Alligator gar aren't easy to catch. Anglers use a variety of methods to catch alligator gar. Legal methods include bowfishing, rod-and-reel, and passive gear such as juglines, limblines, and trotlines. Bowfishing is regulated as a lethal method to harvest fish: once a fish is shot with an arrow, it cannot be released. For other methods, if catch-and-release is intended, the goal should be to maximize survival of fish. 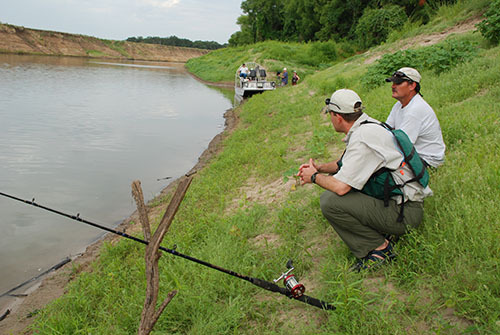 Rod-and-reel fishing for alligator gar can require climbing a steep learning curve. Even experienced anglers and professional guides experience a high proportion of dropped baits, debris hang-ups and failed hook sets. In fact, the jury may still be out regarding the best technique for catching alligator gar on pole and line. In spite of these difficulties, alligator gar can and have been caught using just about every setup possible on a rod and reel, including casting artificial lures, using live or cut bait, and even fly fishing. The most common setup used in Texas is cut common carp placed on a 5/0 or bigger circle hook, treble hook or J-hook with a gap wide enough to encircle the lower jaw. The hook is often fastened by strong braided line to a steel leader, with or without a weight, and fished suspended or on the bottom of a river or lake. Alligator gar typically pick up a bait and travel a good distance before stopping to ingest the bait. The upper jaw and mouth of an alligator gar is cartilaginous and bony, full of teeth, and unlike most fish is very resistant to penetration by fish hooks. For this reason, many rod and reel anglers actually allow fish enough time to swallow the bait and hook before attempting to set the hook or reel in the fish. Upon landing the fish, the steel leader is cut and the fish is released with hook-in-tow. When this technique is used, we encourage the use of relatively small, non-stainless hooks which will degrade over time and reduce the potential for internal damage. The long-term survival of an alligator gar that has swallowed a hook is not well studied, but limited data suggests mortality may be higher in small fish because large hooks occasionally can penetrate vital organs. Successfully hooking a fish in the mouth, and removing the hook prior to release, is believed to provide the highest chance for survival. Attempting to set the hook before the fish has ingested the bait may only provide the angler with a about a 50% success rate; however, this success rate may be similar regardless of how the fish is hooked. The more time an alligator gar is allowed to travel with the bait before swallowing the hook, the more likely the fish may be to drop the bait or wrap the fishing line around timber or other debris. The best opportunity for successfully mouth-hooking an alligator gar may be using a large 9/0 or 10/0 J-hook or strong treble-hook and a powerful hookset to penetrate the mouth just after the fish takes the bait. Often, using a large slip-float on the fishing line can help an angler identify the direction a fish is oriented before setting a hook. Additional leverage or power may be generated if the gar is facing away from the angler when the hook is set. 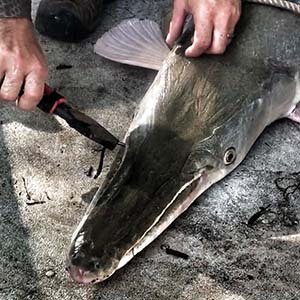 Successfully hooking an alligator gar in the mouth allows the angler to remove the hooks with a good pair of thick gloves and needle-nose pliers. A thick stick or other device can be used to hold the mouth open for access to the hooks. Following hook removal, the fish can simply be released to be caught again another day.